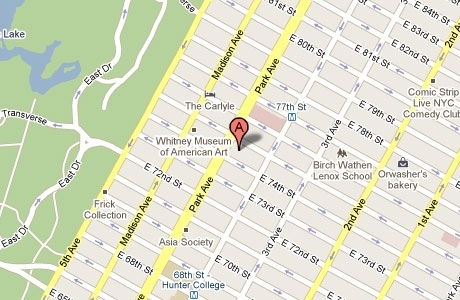 Our New York plastic surgery practice is located on the southeast corner of Park Avenue and 75th Street in Manhattan. Many of our patients take taxis when they come for appointments. If you choose to drive, there's a convenient parking garage on 75th Street between Park and Lexington, as well as a few other parking lots and metered parking on the street. If you prefer public transit, the nearest subway stop is at 77th and Lexington on the "6" line. There are also frequent buses on Madison and Lexington with stops a block away. Just give us a call if you have questions about getting here!